Today was going to be a shaving cream day, but after a good cup of coffee, a few minutes in the carline, and a quiet drive home, I had a lightbulb ingredient moment. This means I scratched my plans to share my homemade shaving cream recipe, just for today. I promise, it will be up next week, but I think this one ingredient could be an awesome addition. One more week! In the meantime, let’s turn our attention to laundry. Because just like coffee and quiet drives, laundry solves all problems. Or wait, maybe laundry creates all problems? That was the case in our home before I finally created a laundry routine that worked for me. And to be honest, I’ve been slacking on my routine this week. Before I go way too far off topic, let’s chat about laundry soap. I shared my first ever laundry post on Live Simply back on February 11, 2014. Now that really dates this blog. That’s two whole years ago, which in human years means that first laundry post is now a toddler. But when it comes to blog years (which work the same way as dog years, I believe), that laundry post is a teenager. And if we take this a step further, that’s REALLY REALLY old for a blogpost. In that two year span of time, hundreds and thousands of people have said “good-bye” to the Tide once and for all (just like I did), and found a new love called, Homemade Liquid Laundry Soap. Today, two years later, I’d like to expand your (laundry) soap-making vocabulary and skills to include a powder laundry soap. But not just any powder soap. Oh no! We’re going to keep this one incredibly simple. In fact, the entire process, from start to finish, only takes about five minutes. Seriously, five whole minutes! To add to the tell-all nature of today’s post ;), I think it’s important to point out that I’ve never been a powder laundry soap kind of gal. I never had anything against powder laundry soap; it’s just that my mother only used liquid laundry soap, and so, as a result, I decided liquid soap was the route to go. 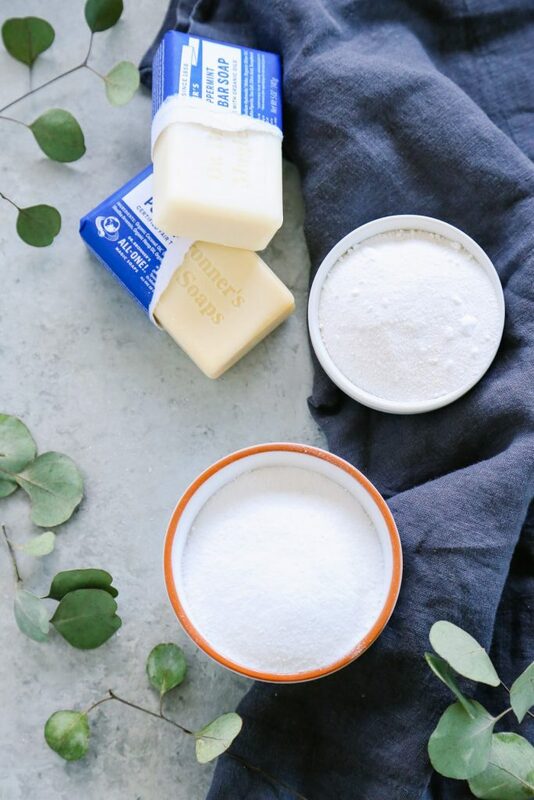 Because I had a deep love for a certain kind of not-so-natural liquid laundry detergent, I created my infamous liquid laundry soap a fews years into our real food journey, and instantly fell in love. I never once gave a passing thought to the idea of making a powder soap. Plus, there are only a bazillion powder laundry soap recipes on Pinterest. That all changed last year. I’m not exactly sure what was happening in our life at the time, but I do know that we were going through a busy season. At some point during that busy season, I ran out of my homemade liquid laundry soap. Now, this may surprise some people, but I decided in that moment of busyness to purchase a “more natural” store-bought soap. Remember my “What to Buy vs. Make” chart? Number three on that chart asks, “What’s the time difference?” At that time, the time difference between making laundry soap and purchasing it from the store was large enough that store-bought won. Dear Mom, please don’t feel like you must make EVERYTHING! There are times when you’ll make homemade mayo, and other times when a cleaner store-bought option is best. There are times when you’ll make laundry soap, and other times when you just need to get to bed at 10pm and purchase soap at the store during your next shopping trip. It’s okay! 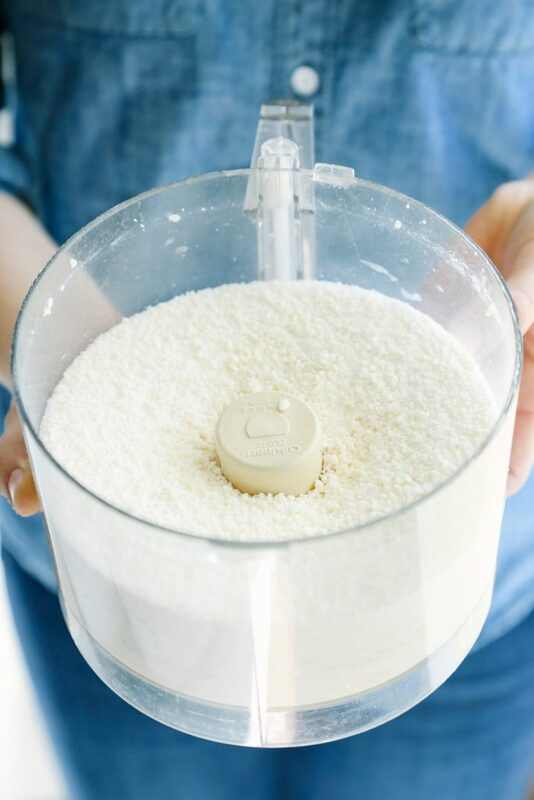 And now, my friend, without any further ado, let’s talk about this powder laundry soap, and the simple ingredients and recipe that won my heart. Castile Soap (Bars): Castile soap is a concentrated vegetable-based soap made of ingredients you can actually pronounce. This soap is gentle on the skin and effective in the fight against dirt, grease, and unwanted germs. Dr. Bronner’s is a very a popular brand of castile soap. For this recipe, we’re going to use the bar (dry) form of castile soap versus the liquid. The bars and liquid are sold in Target, health food stores, online stores (like Amazon), and even conventional grocery stores. Washing Soda: Washing soda, also known as sodium carbonate and sold under the Arm & Hammer brand, is highly alkaline which makes it a great cleaner! The high alkaline level allows washing soda to act as a solvent. Washing soda can also be used to fight against hard water, since the washing soda binds to the minerals, which in turn can boost laundry soap’s effectiveness. Washing soda can be found in the laundry section of most grocery stores, or made at home in the oven. Borax: This white powder, sodium borate, is a natural mineral used in many cleaning recipes. Over the years, some people have expressed concerns that borax isn’t a safe homemade cleaner. I take just the opposite view, especially when you compare super effective borax to most of the main-stream cleaners on the market. 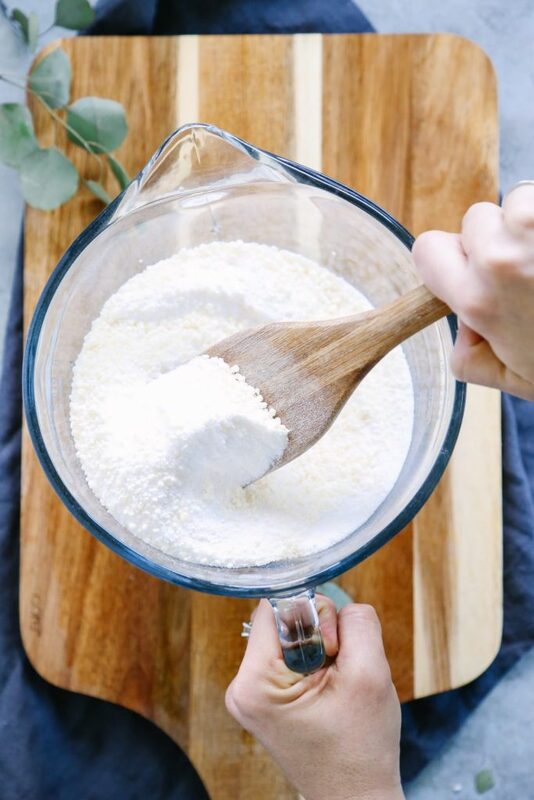 While I feel safe using Borax in my cleaning recipes, I take care to avoid inhaling this ingredient (as you’ll see in this recipe) and keep it away from little hands that may choose to taste-test some of the white powder. The product receives an F according to the EWG for respiration concerns (don’t purposely sniff inside a box of Borax!). I believe this article from Wellness Mama offers valid points to why we shouldn’t throw the Borax out with the box. ...let’s talk about this powder laundry soap, and the simple ingredients and recipe that won my heart. Cut the castile soap bars into small slices or chunks. This step is important to avoid ruining your food processor. Place the castile soap slices or chunks in a food processor bowl. Pulse the soap on high until the soap resembles large crumbs. Add the washing soda to the food processor. Place a towel over the top of the food processor lid, and pulse for 1 minute. After pulsing, the ingredients should be well combined. If you don’t have a food processor use a cheese grater, and then mix the ingredients in a bowl. Pour the washing soda and castile soap into a storage container, and stir in the borax. Add the essential oils, if using. To Use: For top-loaders, use ⅛ cup. For front-loaders, use 1 tablespoon. Place the soap directly in the washing basin with the clothes, not the laundry soap drawer. The “where to buy” links provide links to the actual products I use. As always, I recommend shopping around online and at local stores for the best prices and products you love. Adapted from my book, DIY Natural Cleaning Challenge. Borax Note: As noted above, I feel safe using borax in my laundry soap. If you’d prefer not to use this ingredient, try subbing out the borax with 2 cups of washing soda. I can’t guarantee the effectiveness of this recipe once the swap has been made, but it’s worth the shot if you have strong feelings against borax. Any suggestions if you don’t have a food processor? Hey Lauren, I suggest using a cheese grater :). Hi Kristin, do you have a top or front loader. How does it work with the front loader if you know. Hey Vicki, I have a top-loader, but from our test group for the book, a few people tested this out in a front-loader and were happy with the results. The soap amount is greatly reduced for the front-loader machine. I make most of my own natural cleaners, but haven’t taken the plunge with laundry detergent yet. This looks great! (And so easy!). Does it work in HE machines? Hey Jen, Yes, it should. Be sure to use the smaller amount called for in the recipe when adding the soap to your washer. It does! I use HE machines. Just use about half as much- I use about 1 to 1 1/2 tablespoons per load, and it seems to do the job. Awesome, Sheila! Thank you for sharing! These are low-sudsing soaps, so it is fine. I use 1 tblsp. in my front loading HE machine and it works great. Thank you for the printer friendly version. . Also, thank you for actually doing research and testing. I appreciate facts backed by the science and I am on board with a blog that posts their research sources. Hey Ronda, I’m so glad you’re enjoying the recipes, and the printer-friendly version. Enjoy! Have you tried the recipe with cold water? And if I have soap flakes would that work to? Hey Sandy, I’m not 100% sure about soap flakes as a replacement. If they are anything like castile soap (a concentrated plant-based soap), I think they will work. I’ve found the washing soda really needs warm or hot water to fully dissolve in the wash. When I’ve used cold water, the results have been mixed. Sometimes a powder is left behind on some clothes, which I believe is caused by the washing soda (not fully dissolving) and cold water (based on other experiments with washing soda in my kitchen). My liquid laundry soap works very well in cold water: https://livesimply.me/2014/02/11/homemade-liquid-laundry-soap-all-natural-detergent/. hi! I’ve enjoyed reading several of your posts and recipes today. I’ve been using my homemade laundry powder for a year but have found that it doesn’t whiten whites very well. does your recipe brighten? my sister noticed when she started making my recipe, and living on a farm I have come to accept whites not being as bright as (your preciously favorite chemical “T”-word addiction). :/ but of COURSE, I would prefer whiter whites, too! Hey Margaret, I’m so glad you’re enjoying the blog. I’ve been using homemade soap on and off (supplemented at times with a “more natural” store-bought soap) for so long that I can’t really say if the whites are different than my Tide days. One thing I know that really does help is adding hydrogen peroxide to the wash to make an oxi-clean like product. 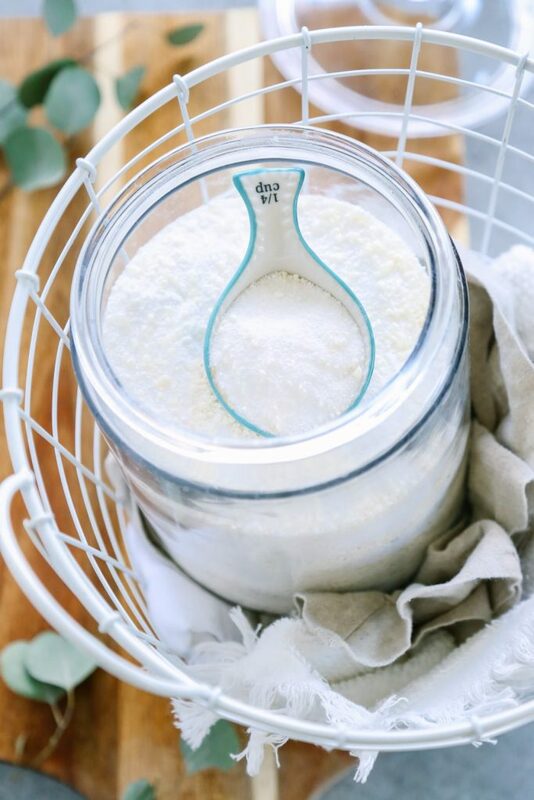 Here’s my recipe: https://livesimply.me/2015/08/13/homemade-oxi-clean-like-laundry-booster/. 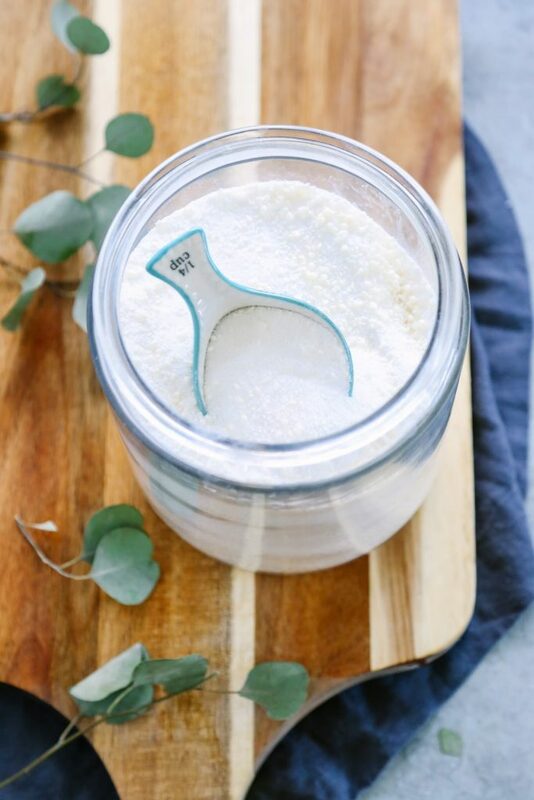 Another option is to use my bleach alternative when the whites are looking a bit dingy: https://livesimply.me/2015/07/19/homemade-bleach-alternative-3-ingredient-whitening-solution/. I, too, make my own laundry detergent, and I recently switched from liquid to powder. I don’t use Borax in mine, since it really is best in hot water, which I don’t use often, but instead add just a little, as in a teaspoon or so, Rid-X septic tank treatment (the powder kind). The enzymes seem to help lift some of those tougher stains. I also make my own 100% coconut soap specifically for use in laundry, because it is so cleansing. I find I get better results if I grate the soap first, rather than use the food processor. I then put everything in the food processor at once. I put in a few drops of eucalyptus and lavender to deter bedbugs and dust mites and make everything smell fresh. It is really awesome soap, rinses clean, and gets most of the grubby stains out of our clothes. If I need to pre-treat, I confess to using Dawn dish soap (the blue kind), water, and ammonia in equal amounts. Probably not the most environmentally friendly concoction, but I am dealing with serious ground in dirt and grease sometimes, as I have a 13 year old boy and a husband who works in construction and on machinery. I haven’t found anything else that works except Goo-gone, which I no longer use. I actually think the powder does a better job than the liquid! This sounds great I too have moved from making liquid laundry soap. One day I ran out got too busy and just added in borax, washing soda, and a few drops of sal suds. Now I just add the two powders a cup each together in a glass jar and use 1/4C to my laundry. With the few drops of sal suds works better then any store brand. Just wondering if anyone had experience with using this kind of soap with hard water? Will that make any difference? Hey Heather, We have very hard water. The washing soda in this recipe helps to soften the water. You could also add 1-2 cups of kosher salt to the recipe–I’ve done that in the past with good success. The salt also helps to soften the water. My husband is a mechanic. Does anyone have any ideas if this or something else will work? I can’t seem to find an alternative to Tide which I want him to stop using. Sigh…. I say yes! My husband and I worked as aircraft mechanics where we got covered in jet fuel and oil everyday and I used this soap. 🙂 It’s worth a try for sure! Thank you for sharing, Melissa! That’s awesome! I just found your site and LOVE it, so amazing. I have a HE front load washing machine, with this soap should I put it in the detergent spot or place a scoop of it in the drum of the machine. I have only ever used liquid in my front loader so i am not sure where the powder kind would go. Usually you just put it in the detergent cup. I try and put it as far back as I can so the water gets it all. Hey Liz, The biggest difference between the dry powder and liquid soap is the way they are used. The dry powder really needs to be used in hot/warm water, and the liquid soap may be used in cold water. The powder soap also has a longer shelf life, since water isn’t involved the process (water can/will breed bacteria over time). Other than those things, it’s just a matter of personal preference. Looking to make this laundry powder but concerned about using my blender to mix up the ingredients. I don’t have a food processor – just a Vitamix – will this be ok ? Also concerned that it will wash properly afterwards as I will need to use for food afterwards. Is this recommend ? Hey Jane, My only concern with using a blender is with the soap getting stuck at the bottom of the blender. I recommend grating the soap with a cheese grater, and then mixing the ingredients by hand. I want to start by saying I LOVE your blog and routinely incorporate your diy recipes in my daily life with personal care and cleaning. I loved your liquid laundry soap but thought I’d give this one a try for a longer shelf life. Do you know which of the two recipes are better for your washing machine as I’ve read mixed reviews regarding borax and castile soap in regards to build up in the piping? Hey Megan, Thank you! I’m so glad you’re enjoying the blog, and the recipes. I’ve found that both have been fine with our pipes. I use warm/hot water with the powder, so I think that may help keep the pipes from clogging. Since the liquid dissolves the castile and borax ahead of time, cold water is fine. Washing soda can also be a big issue with hardening in cold water, so that’s another reason to use warm/hot water. Lol, not a bad thing at all. That’s awesome, Megan! Hi Kristin, I am anxious to try the recipe. Are the amounts critical? I’d like to try with a half-batch first, just to make sure it works okay with our machine, water & the hubbs. Thanks! Hey Carolyn, I’d recommend sticking with the same ratios, and cutting everything in half. Let me know how it goes! Just found your blog and I love it! I was wondering what your thoughts are on the Castile bars vs. Fels naphtha. I have been making my own laundry powder with washing powder and borax for several years, except I have been using fels naphtha bars. Need to make more soon and I’m trying to decide if I should try the Castile. Thanks for your thoughts! Hey Amanda, I’m not very familiar with the ingredients used to make fels naphtha bars, but I am very comfortable with castile soap. Castile soap is definitely what I recommend. 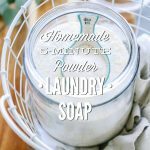 I absolutely love the dry laundry soap recipe! I have tried it with the washing soda and it just doesn’t get as clean. I used the lavender essential oil and it smells wonderful. I have a front load washer and only use 1 TT for regular loads and 1 1/2T for larger or more soiled loads. That’s great, Trisia. I’m so glad you’re enjoying the soap. Thank for sharing your amounts for your front loader. I told you I would let you know how my half-batch turned out. The only word I can use to describe it is “smooth”. It really is a brilliant plan, you know. It’s not that much less expensive than my Biokleen but the laundry just looked & felt nicer. And there were no white flecks on the clothes even though I let the washer swish the detergent about the same amount of time before putting my clothes in. This recipe is a definite winner & you were absolutely right, 5 minutes & I was done! That’s so great to hear, Carolyn! I’m so glad the half-batch worked well for you. Yes & I’m ready to make a double batch now! I made my own laundry detergent several years ago and used it for many years (using fels naphtha instead of castile bars). I have a front loader and during that time, I began to notice a strange smell to my laundry, especially the towels and they all became very, very dingy. Even after using store-bought detergent for the last several years I can not get the smell or color fixed. I rarely, if ever, left the clothes wet in the washer and never let wet items sit in the laundry hamper so I know this is not the problem. I have used vinegar, peroxide, essential oils, etc… to no avail. Has anyone else had these similar issues? I do not want to try the homemade route again with the same results! Hey Penny, I would definitely try the castile bars. I’ve found they clean much better than the fels naphtha bars, and they lend a lovely scent to laundry. Another suggestion is to try washing the clothes in hot water and borax to eliminate the current odors. I was curious: I have cloth diapers and am hoping to use a homemade powder detergent on them. I have read (but not experienced) that bar soaps (castile) aren’t ideal for cloth diapering. Have you had experience using this “recipe” on cloth diapers, or do you know someone who has? Hey Maria, I don’t have any experience using this recipe on cloth diapers. I googled “castile soap cloth diapers” this morning and found this post: http://www.measuringflower.com/2013/08/homemade-allnatural-cloth-diaper-detergent/. It looks like a similar recipe, but she does skip the castile soap. I know there a couple of natural oxi-clean brands on the market, I think BioKleen makes one. So maybe this is a better option? Sounds good. 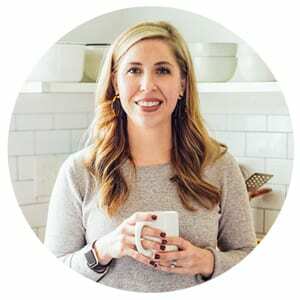 I had already purchased what I needed to make this recipe – and I am so tempted to just try it on my diapers – but don’t want to risk the adverse affects. bah… what to do 🙂 I can say that peppermint essential oil smells amazing when I open my tin! Thanks for the quick reply. I follow your blog, and have made the loose powder (make up) and love it! I often suggest friends to check out your diy’s etc. if they are interested in natural and cost-effective alternatives! Cheers!! Hi, I would love to make this powder detergent, however we don’t seem to have Borax in my country, can I make it without? Or is there a substitute for it? Hey Conny, Borax is the name brand in the States, so you might be able to find it by its scientific name: sodium borate, sodium tetraborate or disodium tetraborate. If not, adding extra washing soda will work, but it won’t provide the same cleaning power. Do you know if this is safe for septic systems? I’d love to try it! Thanks. Hey Annne, I’m not really sure. Let me dig around on the internet about each ingredient and its use with a septic system, and I’ll come back and comment :). I made the powder detergent, it was easy and fast to make! I really want to add the cleaning oil. I bought some the brand is (Tisserand) it also says aromatherapy. I don’t know if by me adding these essential oils, will affect the detergent. 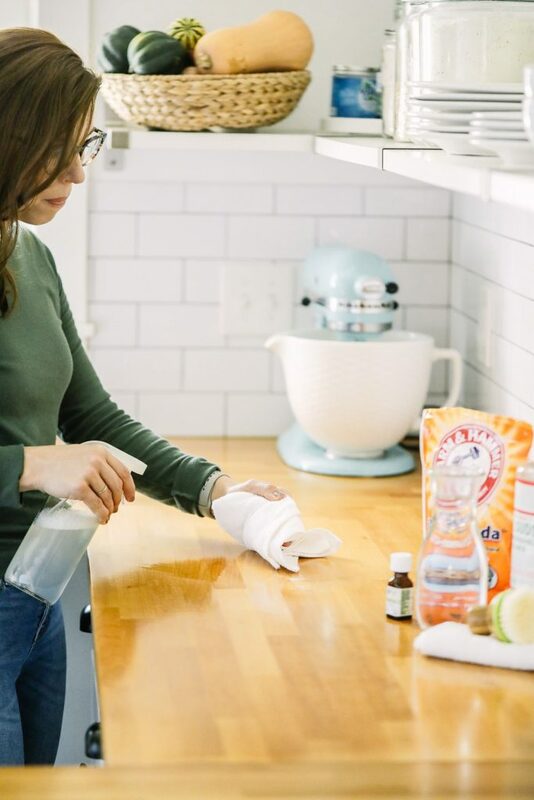 Should I buy an essential oil that is for cleaning? Or can I add the ones I have? Hey Sandy, I’m so glad the recipe was easy and fast for you! Yep, any essential oil you currently own will work. Some oils are known for having properties that complement a cleaning solution, like lemon or tea tree essential oil. But any essential oil should work, especially if it’s added for scent. Great blog! I have been using this recipe for a month. Howeve . I use 1\2 a cup per large load. My question is this really doesn’t suds up. Does anyone complain about this? Hey Lana, I’m so glad you’re enjoying the soap. Yes, this laundry soap doesn’t suds up like commerical laundry detergents. Most detergents add special chemicals to create the suds. I don’t use borax, but substitute Bicarbonate of Soda. This works really well. Awesome, Susie! Thank you for sharing! Is there any reason why you could not mix the powdered laundry detergent with hot water prior to adding it to the wash? That way, the solids could dissolve, but you could still wash with cold water? Definitely, Kecia. You could try that! Hi Kristin, this recipe is great as it removes odors. However, I am experiencing white sweat stains on dark color t-shirts after the laundry is done. Any ideas on how to remove these sweat stains? I love your blog. Hey Cece, I’m so glad you’re enjoying the blog! I wonder if the powder isn’t fully getting dissolved in the water? I might try mixing the powder (the amount being used in the wash) with a bit of hot water first (in a cup will work), and see if that resolves the issue. If the stains remain, then it might be another issue…do you have hard water? Adding a softener might help? Let me know how it goes, and we’ll keep troubleshooting! Hey Heidi, I think castile soap does a better job at cleaning, and it’s made with “cleaner” ingredients. 🙂 I haven’t researched Fels Naphtha in a while, so that may have changed. I’d love to use it but I wash with cold water only. Any other laundry soap recipes for cold water? Hey Jenn, You could dissolve a bit of the powder in a cup of hot water, and then add the solution to your washer. 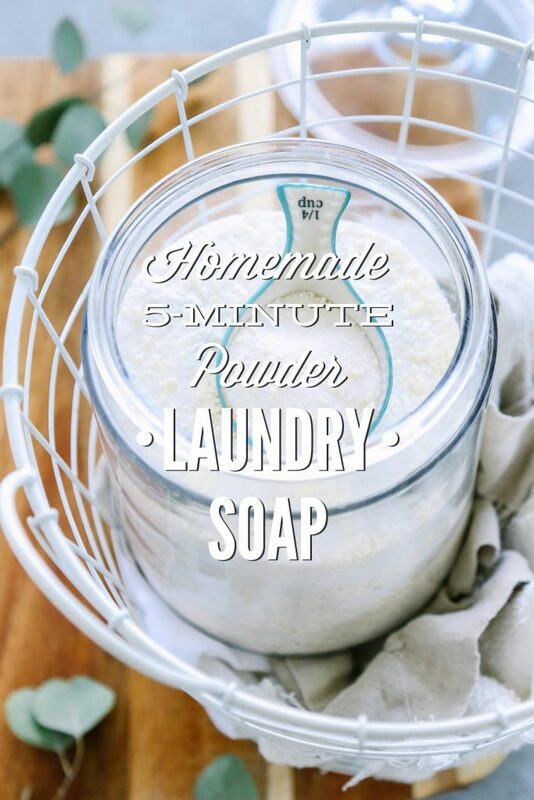 Or you could try my liquid laundry soap: https://livesimply.me/2014/02/11/homemade-liquid-laundry-soap-all-natural-detergent/. I’ve found the hot water is necessary for dissolving the powder ingredients. Hey Christie, We just purchased a new washing machine and I’ve noticed that the same thing happens in the laundry soap “drawer.” I’ve been mixing the solution with just a tad bit of water before adding it to the drawer. I may even try placing the soap actually in the washer with the clothes. For some reason any powder is an issue for us. Hope that helps! I never use warm/hot water for washing clothes. Is the soap still effective? I’ve been using liquid soap nuts, which I like, but it’s on the pricey side. Thoughts? Hey Tamara, I’ve found that a powder soap, like this, really needs warmer water to fully dissolve. You could try colder water and see what you think. My liquid soap works well, in my opinion, with cold water. Hi! I stumbled across your blog and can’t seem to get off of it! Hoping to try this laundry soap soon. Quick question, do you use a fabric softener at all? I currently use a store bought detergent, along with store bought softener. Hi! I just tried this at the weekend with homemade bars of Castile (olive oil) soap- it worked well, although next time I might add more essential oil scent as it’s very faint. I had to grate the soap as I don’t have a food processor, but I wash at 40 degrees C and it all dissolved. Just thought if anyone wanted to know if it works with homemade soap- it does! Awesome, Becky. Thank you for sharing. I have well “hard” water has anyone had any success with hard water? Never mind ? I just found comments about hard water!! Going to try it out! Just wondering if instead of lavendar EO it would be useful to use lavender-scented castile liquid soap? Or would that dissolve some of the powder and make it clumpy? Hey Christy, You could use a lavender scented castile soap bar. Hey Kristin! Love the recipe cant wait to try it! I see on the recipe you added essential oil, will this make the mixture less dry and instead go gluggy and sticky? I LOVE strong smelling laundry powder and only feel this will work for me if i have a scent agent too! I blend the oils with some of the powder in the food processor, and it gets completely incorporated. No wetness or stickiness at all! What could I substitute for Borax? Have tried any laundry soup without it? I have stalked your blog for the past few weeks and I love everything about it. The DIY Cleaning is my favorite section to read and try new things. Thanks for taking the time (and fails) for finding just the right combinations. Hey Kylie, I have and don’t care for the results without the borax. It works without borax, but it’s not as great (in my personal opinion). If you’d like to skip the borax, I recommend adding more washing soda. Just a quick tip. To go easier on your food processor (I use a blender) you can put first the bar of soap in the microwave for a minute or so. It puffs up in a huge souffle as the internal water goes to steam. Take it out and carefully pull apart with a fork (watch out for steam) and let cool. Now no dense chunks to challenge the blades. You can google it to see in action. Hi Kristin, I love making and using your products. Thank you for doing all the research and development. I was noticing that my microfiber dish towels don”t do a very good job of drying dishes. The water doesn’t penetrate the fabric. Do you know why that is? Hi! Thank you for your post! Do you know if this will work in HE washers? Thanks! Hey Caroline, Yes, it does :). You’ll only need 1-2 tablespoons of soap. Would love to know if anyone has used pure soap flakes? I bought a bag of pure soap flakes at my health food store and I can’t seem to find a recipe that uses this stuff ! Help anyone ! Hey Cathy, Hmm, good question. I would give it a try in this recipe. I used to make liquid detergent and got away from it because life got in the way! I am excited to try this version because it seems so much easier. If I use my food processor can I use it for food afterwards? Is there a special way to clean it? Hey Lynnette, I’m excited to hear what you think. 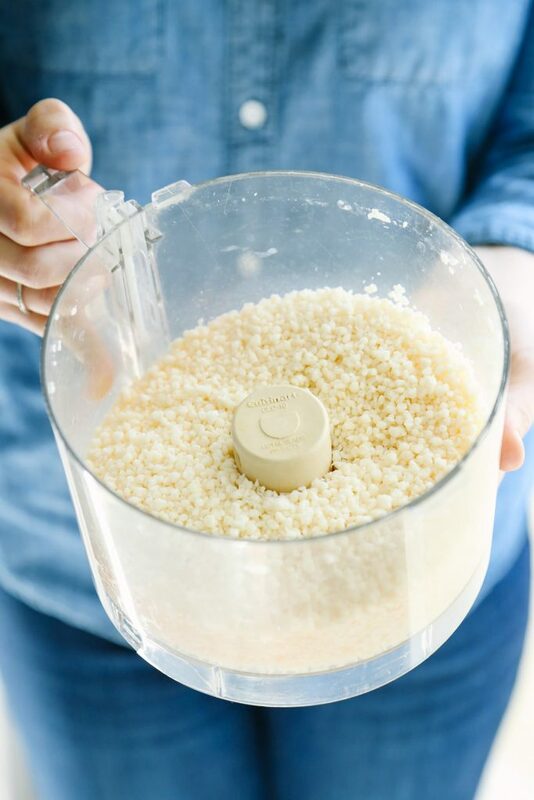 Since all the ingredients are cleaning ingredients, you can rinse the food processor out with soap. The ingredients will actually help clean it, too. Just rinse it clean afterward :). I’ve heard that washing soda is ok to use every now and then, but that excessive use can actually wear out your clothes faster. What has your experience been with this? Do you use this as an ever day laundry detergent? Hey Chloe, I use either this or small-company brand that uses the same formulation and haven’t had issues. I do turn certain items inside out (dark colored items, like black jeans). Occasionally I’ll change things up with a liquid detergent. Hey Debbie, Most essential oil-based laundry soaps won’t add much perfume scent to clothing (if at all). You could try adding a few drops of essential oil to dry balls before drying the clothes with them. The smell won’t be as long-lasting or apparent as commercial scented formulas, but it will be slightly noticeable. Can I keep all the ingredients separate and mix in the washing machine? I ask, because I would rather use the liquid soap, but not make a liquid detergent ahead of time. Hey Deborah, You could try. That should work. Thanks! I bought Air Tight containers and can just use a little of each. Figuring out how much of each might take a little math, but it will be less messy for me than mixing it together. Love this idea and I mixed up some this Morning!!!!! One Question…Can this be used to wash up the Dinner Dishes? I thought it was posted elsewhere that it could be…Also I am gonna run the hot water from my Sink in some sort of Container and add my powders to it and stir really well so they will dissolve better!!!! Thanks for Sharing!!!! Blessings to You and Your’s!! !